Raja Saw Dhani In Temple! Ishq Ka Rang Safed 7th March 2016 Episode Written Updates :- The last night episode of the TV series “Ishq Ka Rang Safed” starts with suddenly Dhani catches the glimpses of the Raja’s mother and his aunt who came to Ashram with Raj Laxmi in order to have some rest after get injured in market. Dulari called Dhani from back side and Dhani moves back with her. Dhani try to avoid the situation but she had an encounter with the Raja’s mother. Now Dhani go for a market with her mom suddenly Viplav meets with Dhani in the market. Dhani get scared with Viplav’s attempt to meet with her but the love birds keep staring at each other. Now Viplav comes to Dhani and pulls her behind the shop and talks to her. There he kisses Dhani on her forehead. Dhani smiled and also in the last episode we saw that raja was about to her of her elder brother but his mother stopped him. In the last episode also Dhani and Viplav shared some passionately romantic time. Viplav and Dhani didn’t catch by their family so successfully they have some quality time. In today’s episode we will going to see that Dhani will move to temple in order to make her statement truth that she will do Puja with Viplav as this is a ritual to do this couple. When Dhani will move to temple Kanak will come there and in order to hide herself from Kanak, Dhani escapes from there and when she was moving out of temple. Suddenly while trying to escaping from the temple Dhani had an encounter with Raja and Raja call her Suman. 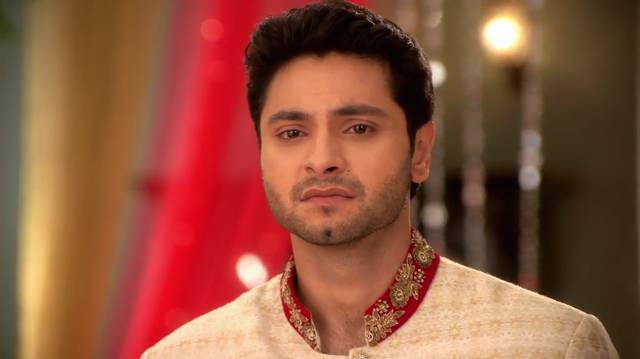 After that Raja gets a hint that the girl with whom Viplav loves is none other than Dhani aka Suman. Now if Raja will clear this in the front of Kanak that Viplav is in love with the girl and she is Dhani. Although Dhani did not see Raja as she was in hurry to rush from the temple to avoids Kanak. Surely this will be creating havoc in the Dhani’s life. It will be interesting to see in the romantic TV series “Ishq Ka Rang Safed” that whether Dhaani’s past life will be come in front of her present life to ruin her life. To know what happen next don’t forget to catch tonight episode of the show “Ishq Ka Rang Safed” on the Prime Time at the Colors TV!! !